Let’s talk about the moment I entered Heaven. It was unexpected at first, but Brendon Urie’s high notes carried me there and I have no intention of setting foot back on earth when all things good and holy are here for me. Sunday provided me with a religious experience like no other, where for a couple hours music was my religion and nothing else in the world mattered. Now lets not disregard this as just another concert story because LET ME TELL YOU, this was not just another concert. This was a gift from God himself. Let me start out by saying that I must be the luckiest child on earth because the series of event that lead me to this night were something I never imagined to occur outside of my dreams. Let’s set the scene. It was a cold February afternoon and Panic! at the Disco tickets just went on sale. As I prepared to purchase them after school that day, I got the notification no one wants to see: “SOLD OUT!” I was devastated, but determined, and spent every week since then checking on Craigslist, Facebook, and any platform I could think of. I was willing to pay anything because seeing Brendon *freaking* Urie live in the flesh would be priceless. Flash forward a week before the concert. It was crunch time. With no luck so far, I began to make plans to just sit outside the venue and listen, because even that would satisfy my need to have Panic! dancing through my blood stream. Then a miracle occurred. A mere stranger, or perhaps my guardian angel, appeared in the form of a Facebook message bearing the gift of two tickets being sold for face value. That right there was the quickest purchase i’ve ever made with someone I’ve never met nor built up trust with before in my life. But the risk was worth it. Now here we are on Sunday, the holy day. Many Panic! attacks have already taken place on the way there and we have begun taking a running total. Over three hours before gates open and we were stuck in line four blocks from the venue. Hundreds of equally die hard fans were in front of us, but it didn’t matter at that point. We were going to be in the same. general. area. as royalty. Just as we were getting settled, another angel appeared. This time calling me from her spot in the front of the line. She asked if we could wait with her stuff while they got food and HOLY MOTHER OF ALL THINGS GOOD IN THIS WORLD it lead me to being just a few steps from this holy land. After meeting some new friends and seeing some old, it was finally time to enter the temple otherwise known as Stage AE. Bag check went quick (no gender segregated lines this time, praise the lord) and we were in. We freaking BOOKED IT across the venue and as we passed the huge crowd of people at least five rows deep in the middle, we saw the golden light. The empty area just left of the center with only a handful of VIPs who paid hella money to get in early. And then there we were, mere commoners running into their spots in the SECOND. ROW. This wasn’t real life. This couldn’t be happening. But it was and it did and as more and more people filled in behind us, it finally became real that only one row of people separated us from the greatest gift God has ever given us. And now after experiencing the greatest adventure of out lives we also get to be blessed with the sound of music for the next five hours? Yes PLEASE. With three opening bands, every second that I didn’t see Brendon Urie was a second I got more anxious. The first opener, Dorothy, brought the heat and gave the crowd a lot of energy as we waited for a band we actually knew. SWMMRS was a bit much for me. I’m just gonna leave it at that. Then we had YET ANOTHER GIFT FROM GOD. Andrew McMahon in the Wilderness. I’ve been listening to Andrew for a while ever since we was in Jack’s Mannequin and seeing him live was just an amazing crowd pleaser. Proud to be such a big fan. His story is beautiful and he is beautiful and his positivity is overwhelming. If I wasn’t already peeing my pants with anticipation for Panic!, he would have brought my hype level up so high. Super sad his set was so short but PANIC!!! And then it happened. He arrived in his natural and glowing state and serenaded us so hard that girls began flinging their clothes at him. Brendon Urie was a real person and he was only 20 feet away from me. I can’t even begin to explain every perfect moment because it was an hour and a half long set and i’m pretty sure I have a word count limit here. But just know that every high note, every backflip, and every article of clothing he took off lead me closer and closer to Heaven and I will never have an experience as ethereal as this again. I’d like to thank not only God, but Jesus for making this happen and my guardian angels that helped along they away. I stood up. I sang Hallelujah. And I danced until my phone ran out of storage. 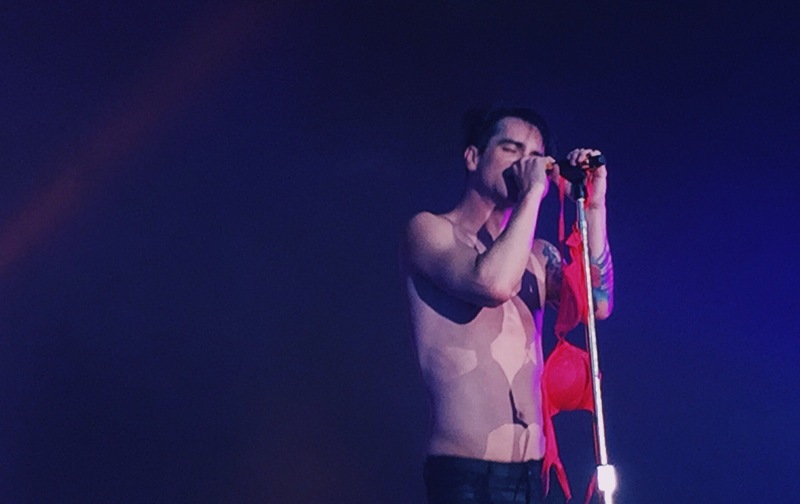 This concert opened my eyes to what perfection actually means and Brendon Urie, damn, you are nothing but perfect. But now that I love you, I must let you go.